Charlie Robertson's perfect game was a Major League Baseball game that took place on April 30, 1922, between the Chicago White Sox and Detroit Tigers. Robertson, pitching for the White Sox, retired all 27 batters he faced to pitch a perfect game. Robertson was the White Sox's starting pitcher for their game against the Tigers in Detroit on Sunday, April 30, 1922. The 26-year old Robertson, who had played for the American Association's Minneapolis Millers the previous season, was making his fourth start in Major League Baseball. He faced a Detroit team that ended the season with a .306 batting average. Robertson started off the game by striking out Lu Blue. In the second inning, Chicago's Harry Hooper and Johnny Mostil scored on a Whitey Sheely single for the only runs. A spectacular diving catch by Johnny Mostil on a liner to left by Bobby Veach in the second inning preserved the historic feat. Throughout the game, Tigers manager Ty Cobb complained to the umpires that Robertson was doctoring the ball. Robertson's uniform was checked, and Detroit kept several game balls, but nothing was ever found. In the ninth inning, Robertson retired pinch hitter Johnny Bassler for the final out. The game lasted one hour and 55 minutes. It was 34 years before anyone else pitched a perfect game in the majors. For White Sox catcher Ray Schalk, it was one of four no-hitters he caught in his career. 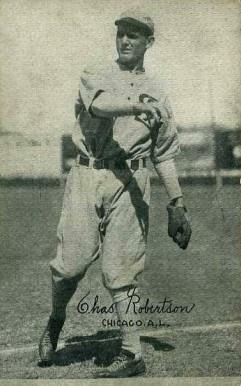 During the 1922 season, Robertson had a 14–15 win-loss record and a 3.64 earned run average. He finished his career with a win-loss record of 49–80 and a 4.44 ERA, and according to one writer, "Hands down, Robertson is the least-accomplished pitcher to have thrown the most accomplished of games." ^ a b c d e Coffey, Michael (2004). 27 Men Out. Atria Books. pp. 36-51. ^ a b "Box score". baseball-reference.com. Retrieved January 21, 2014.